Like snowflakes in winter, Snom Technology AG keeps pumping out new SIP-compliant business IP phone models -- each one more polished than the last. 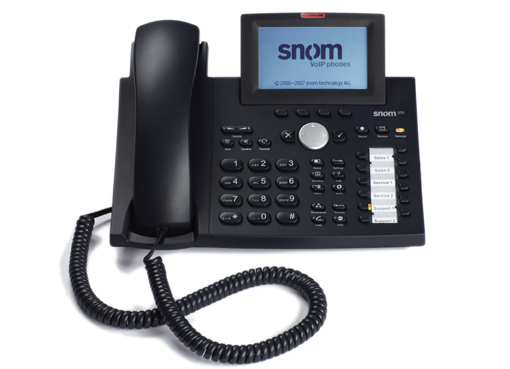 The latest model, the snom 370, offers a larger display, expanded memory and VPN access. The snom 370 features a larger display area with built in greyscales to provide users with a clearer view and allow for more information on the screen. The expanded memory capacity enables the phone to support more applications, such as presence indication and presence displays of other users. The phone can also provide users with the ability to customize the display by depicting graphics and high resolution pictures to show the status of contacts. The snom 370 can also support several audio devices simultaneously such as the handset, headset and loudspeaker. And a multicast paging mode makes it possible to use the phone for large scale public announcements. With the addition of a new provisioning mechanism, the 370 allows for the dropping of configuration files and software loads into a file system, simplifying configuration and management for administrators. Updated security features include direct access to a VPN in order to secure communication to an insecure PBX system. The snom 370 will retail for $280 when it's available for purchase in April 2007.